"In his speech responding to Russia's argument that if Kosovo was an exception, than Crimea is as well, Obama said that where Crimea's Russian-speaking population was not in danger, in Kosovo, thousands of people were persecuted and killed, and that the conclusion of each crisis was substantially different. Obama, however, left out something essential and common to Washington and Moscow. 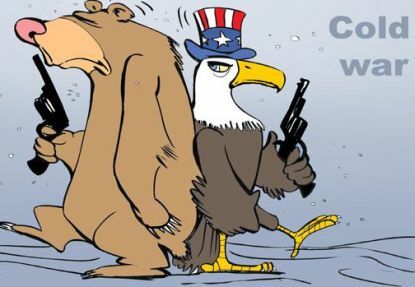 That in both cases, the U.S. and Russia both do as they please and always act in accordance with their own geostrategic interests." 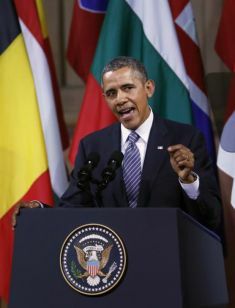 At the Palais Des Beaux Arts in Brussels, President Obama offers his strongest criticism of Russia's annexation of Crimea, countering the argument that America is hypocritical because of NATO's actions in Kosovo, or its own actions in Iraq, or Mar. 26. The U.S. president the other day responded to Russia's argument that if Kosovo was an exception, than Crimea is as well. Barack Obama noted that, contrary to Crimea, where the Russian-speaking population was not in danger, in Kosovo, thousands of people were persecuted and killed, and that the conclusion of each crisis was substantially different. The territory of Kosovo took almost a decade to achieve independence in a process that involved the United Nations. In Crimea, a parliament met in closed session and under the threat of arms, declared unilateral independence and immediately announced a referendum with the results known in advance: integration into Russia. Obama stressed that the resort to force is “proof of less influence, not more,” particularly before neighbors of much smaller critical mass than Russia. Obama, however, left out something essential and common to Washington and Moscow. That in both cases, the U.S. and Russia both do as they please and always act in accordance with their own geostrategic interests.